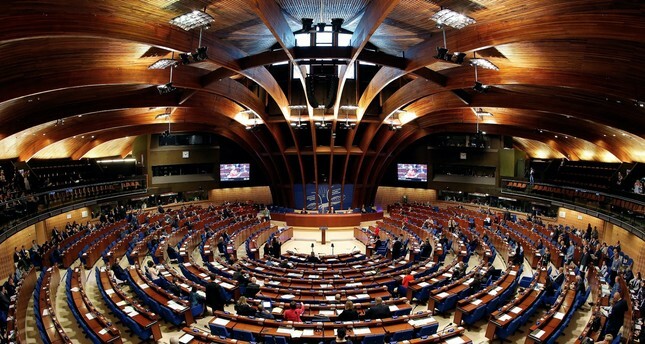 A new political group has been founded in the Parliamentary Assembly of the Council of Europe (PACE), which consists mostly of parliamentarians from Turkey's ruling Justice and Development Party (AK Party). The Free Democrats Group (FDG) currently has 20 members, including seven from Turkey, five from Italy, four from Azerbaijan and one from Bosnia-Herzegovina, Romania, Serbia and San Marino, respectively. To establish a political group in PACE, a minimum of 20 parliaments from six different countries must be represented. Amid efforts to establish the FDG, which is the sixth political group to have been formed within PACE, several AK Party members resigned from the European Conservatives Group (EC) and the Europe Public Party (Christian Democrats-EPP). The head of the FDG is Italian parliamentarian and member of the Italian Senate Adele Gambaro. It is not yet entirely clear why the FDG, which consists of mostly liberals, conservatives and Christian Democrats, has been established, nor how it will be positioned within PACE's political spectrum. Efforts to found the FDG began when PACE was in crisis because its Russian delegation has been excluded from meetings for months because of the conflict in Ukraine. In response, Russia decreased its budget contribution to 20 million euros, which negatively affected work by PACE. There are rumors that conservative Russian parliamentarians might join the FDG after their return to PACE. Still, since its establishment in the second half of 2017, according to bylaws, it is not possible for the FDG to benefit from the PACE budget until 2019. PACE President Pedro Agramunt, on the other hand, met with Syria's Assad in Damascus where he went via Russian military plane a few months ago without authorization. Damaging the prestige of PACE, the meeting led to an institutional crisis and the legal process to overthrow Agramunt began. For this purpose, a voting session is planned for Oct. 9. However, before the session occurred, Agramut announced on Saturday that he was resigning from his mission.